Korean Take-out – Hello Korea ! IMG_0251, originally uploaded by Almost-Human. 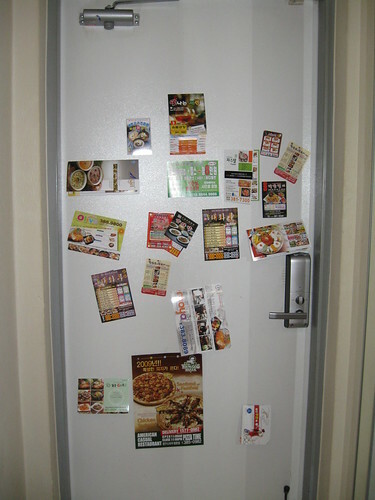 So on the inside of my door I’m saving all the take-out brochures that often appear when I return home. These glossy brochures have magnetic strips on them and hang on the doors, because each one of our apartments boxes has a metal fire door as our front door. I’ve yet to call one, since my pronunciation of my own address isn’t so good. But the food looks great and seems pretty reasonably priced. You can always tell who’s had take-out, because you’ll see the bag or box of dirty dishes waiting in the hallway outside people’s doors. There’s very little disposable take away containers here in S. Korea. Instead, they drop off real bowls with lids and utensils, and then return to pick them up once eaten from. As I said previously, bicycle lanes are on the sidewalks with the pedestrians and motorcycles are prohibited from the sidewalks – but the take-out guys seem somehow exempt from that rule, and the only real valid traffic worries here are being run over by a take-out scooter as he jumps the sidewalk and pulls up to buildings, or zips back onto the street between cars. I want to rent a car, drive to the mountains, and rent a cabin for the weekend. But it sounds like I’ll be doing this by myself. (sniff, sniff) I think I first saw this on a K-drama, actually. It just seemed beautiful and nice, and a great way for friends to hang out and actually talk. All this running around and bar hopping, etc. that my English teachers do – there doesn’t seem to be a lot of actually getting to know one another. I also miss cocktails – which are good for conversation. Slamming beers is one kind of socializing yes, but it’s too fast paced to take the time to learn anything real about anyone. if this cabin in the mountains does indeed exist, we should go for spring break? maybe with a small group? I’m putting the word out. There are cabins in the national parks, only you have to reserve them. There are cabins for rent supposedly on-line, only you need a Korean to book them and then you have to get there. We need a Korean person with a car who’s happy to spend some time with us I guess.